Palki Ultimate is a responsive and SEO ready blog style blogger template. If you running a blog site, then Palki Ultimate is your perfect choice for your blog site. Simple and clean design make your blog more attractive. You can stick 2 important posts as a featured posts on Homepage (using specific label). Palki Ultimate has more attractive features these are make your blog more beautiful. Palki Ultimate blogger themes is another awesome blogging themes for blogger. This is super fast blogger themes for every blogging blog. 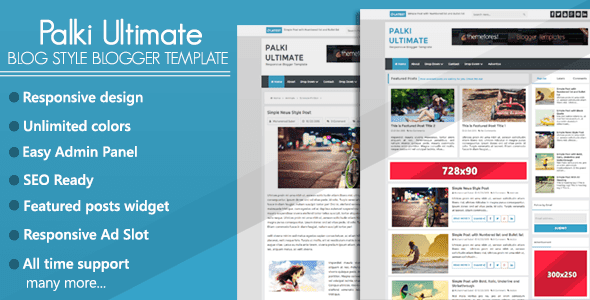 The minimal design of Palki Ultimate blogger template make your blog more attractive. This is first time blog style blogger themes from MS Design BD. First time in this template we used CSS Animation for make this template more attractive and beautiful. You can download this awesome blogger themes for free.